Packing is an essential part of the moving process. Whether you decide to pack yourself or hire our professionally trained team to help you, we’ve got your back. Speedy Movers offers all the packing supplies you could need to keep your items safe and secure during your move. With all the stress of moving, the importance of packing can take a back seat. Speedy Movers’ professional moving team can provide exceptional packing services that can erase any additional stress to your pending move. Choosing Speedy Movers for your packing needs ensures that our company values and commitment to our customers stay with you from start to finish! Our skilled movers aren’t just expertly trained to get you from one place to another; they’ll guarantee that your items are safe and secure throughout the entire moving process. Our services are designed to be custom tailored to each customer! Just need help packing a couple rooms but not everything? No problem! It’s up to you how much or how little help you need. You don’t have to be moving to capitalize on our expert packing either! We’ll help you pack for storage as well. 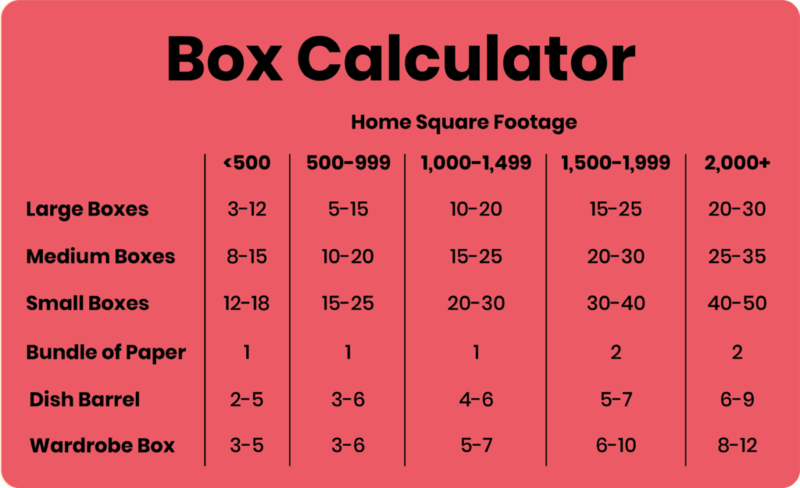 • 1.5 cubic foot moving box: The smallest box we sell, it’s often referred to as the book or record box; best used for small heavy objects like books, records, cans, jars of food, utensils, flatware, shoes, etc. • 3 cubic foot moving box: Referred to as the lamp or lampshade box; frequently used interchangeably with the 1.5 cubic foot box. • 4.5 cubic foot moving box: As the box gets larger, use for lighter objects such as pillows, bedding, and stuffed animals. • 6 cubic foot moving box: Use for light objects; if you pack heavy items in this box it will be difficult to move. • Picture or mirror moving box: A four-piece box that can come in large or small sizes can be customized by telescoping in and out; use crumpled packing paper in the corners to add cushion and make sure to wrap your mirror or picture with bubble wrap before placing it in the box. • Wardrobe moving box: Allows clothes to be transported on hangers; includes a metal bar along top of box to hang clothing. • Boxes for moving dishes: Also called a dish barrel or dish pack; it’s the strongest box available; pack fragile, breakable items such as china; usually used for kitchen items.